How to reach Vichy? Auvergne-Rhônes-Alpes region. Allier department (03). Find us on the Google map. 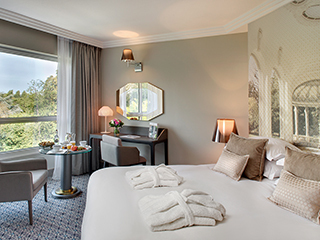 Nestling in the heart of the Napoleon III park and on the shore of the Allier lake, the VICHY CÉLESTINS SPA HÔTEL is situated near Vichy downtown, at the heart of France. Close to: Congress centre (amphitheatre of 500 and 1 200 seats) 5 min by step from the hotel, majestic Opera house, casino, 500 shops opened 7 days a week, 2 18-hole Golf courses, the jogging course, the omnisport center unique in Europe, Olympic pool, racecourse.